Very central beautiful two bedroom apartment, bright and airy, with high ceiling in a classic French building. The living room is very enjoyable with a charming atmosphere, with big windows and a French balcony. There is a double bed in one bedroom and two separate single beds in another bedroom, plus an extra foldable bed in the walk-in wardrobe. Cable TV with over 100 channels including international like CNN, BBC, Russian 1, DVD with films available, Netflix, etc. So if you are looking for a light-filled apartment close to shops, restaurants, and the beach, this one is for you. The apartment is located in the center of Cannes, in the so-called banana (the banana shaped area in the middle of Cannes). 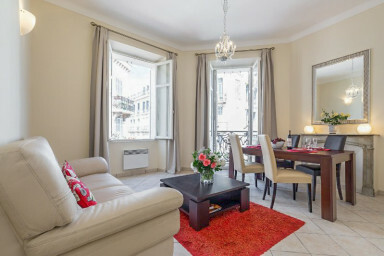 You will be literally only two steps away from the main shopping street Rue d’Antibes, and just a short walk from the beach, and the Palais des Festivals. Close to all local attractions – beach, local food market. So you really do not need a car.